BlindBat is one of those sneaky advertising-supported programs which computer users download onto their computers because they are convinced that these applications are going to be very beneficial. However, it is not as it might seem at first. 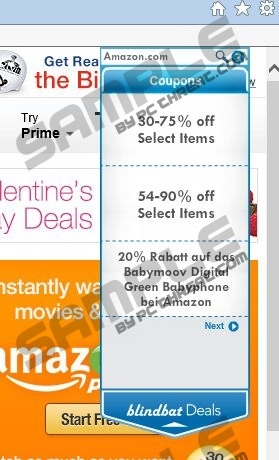 First of all, the fact that they are going to show you various deals and offers does not seem so exciting when users find out that they will not be able to stop these advertisements and they will appear every time they browse the web, especially such online shopping websites as ebay.com, amazon.com, walmart.com, and the like. It means that they might even interfere with your browsing activities and even not let you use your computer freely. Besides, they might collect information related to your browsing habits. If you know that you will not be able to get accustomed with all these annoying features, we will definitely recommend removing BlindBat from your system and never installing it again. It is because this adware program might cause more harm than benefit. This advertising-supported program is not the only one which works in this manner. There are other ones based on the same template, for instance, Kozaka, SquirrelWeb, and Trontizer; you should not trust them as well because they are going to act in the same manner as BlindBat. If you install any of these programs onto your computer, you will definitely notice a variety of advertisements. BlindBat informs the user about all these advertisements prior the installation; however, it does not mean that they become less dangerous. We definitely do not recommend clicking on any of those ads because you might be redirected to the websites whose content is unknown or even malicious. The publishers of BlindBat are not going to look after these websites, which means that you might be exposed to malicious software and thus infect your system. Besides the fact that BlindBat is interested in your browsing habits, including search terms that you enter, the content that you access on the web, and the time you spend on particular websites, it has even more drawbacks. For instance, it tends to come bundled with freeware applications, for instance, Linkswift and WindowsShopper, which means that these programs might be installed onto your computer as well. Nobody wants a stack of unfamiliar programs on their system; thus, you should always select advanced installation in order to be able to unmark all those additional software applications that you do not need. If you have downloaded BlindBat on your system, but it seems rather useless, you can delete it from your system anytime. You can get rid of it manually or automatically. If you choose manual removal, you can erase it if you follow the instructions that we have provided for you below. However, if you want to get rid of it faster, you should acquire an antimalware tool, for instance, SpyHunter and then just simply perform the scan. This tool will remove all the existing threats, including BlindBat. Select it and go to Add or Remove Programs. Find the unwanted application on the list. Click the Start button and then select Control Panel from the menu. Right-click on the BlindBat program. Type “Control Panel” and its icon will appear. Go to Uninstall a program and then right-click on useless software. Quick & tested solution for BlindBat removal.